Who hasn’t had the occasional impulse to cause the extinction of the human race? Never had that stray thought that maybe we’ve made a bit too much of a mess of the world and need to exit stage left? And since we live in fear of biological warfare or pandemics, why not make a game where you become this self-same agent of ultimate destruction? If you’re a fan of fun apps, then you might want to check out Plague, Inc.
I’ve been playing Plague, Inc. casually on my phone for years. A board game version came out a few months back, but at the time of writing this, I’ve not had a chance to play it yet. It’ll be interesting to see how the two versions compare. But for now, Plague, Inc. often comes out when I’m grinding some cardio at the gym. 2-3 games, and I’m done with a sweaty session on a bike, having wiped out human life on earth a few times over. The basic game mode starts you out as a simple bacteria, with ongoing wins unlocking alternative modes such as virus, parasite, bioweapon, and more. Special modes have been released that include vampirism, zombies, and mind-controlling worms, among others. Given a map of the world, broken down country by country, you choose a starting country where the plague begins. Once Patient Zero is infected, the work begins. You watch as planes and boats zip around the continents, while helpful pop-ups provide a few tips on how to best manipulate the growth of your chosen infection. 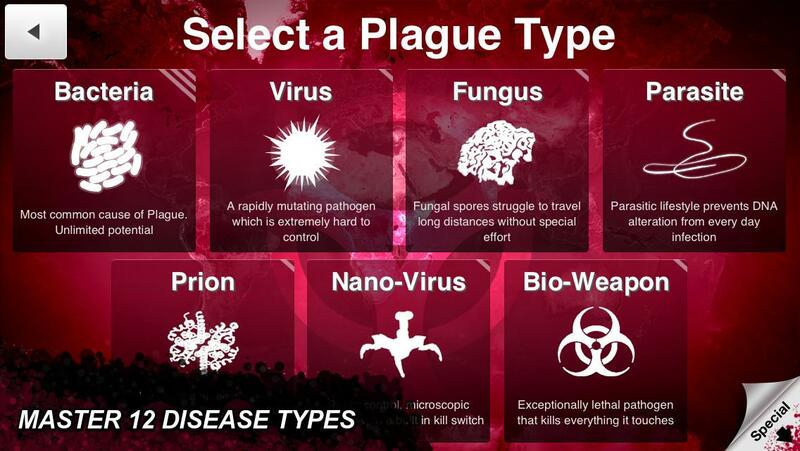 As the plague starts to advance, you receive infection points, which you then use to evolve it in various ways. For instance, you can improve your plague by increasing its infectiousness, making it easier for people to pass it along via sweat, sneezing, rashes, or…yknow…open, bleeding sores. You can add symptoms like insomnia or nausea, all the way to inducing full-on heart attacks and comas. You can increase the number of transmission vectors (such as via animals or blood), and also enhance the plague’s resistance to things like hot/cold environments or modern medication. You win when everyone’s infected and dead. You lose if humanity finds a cure before everyone’s dead. Simple enough! The main dynamic of the game is a balancing act (at least for me). Increase the severity or lethality of the plague too quickly, and the world will notice and take measures to stop it. This includes researching a cure faster, restricting travel, accelerating medical response teams, or even nuking infected cities. Spread too slowly, and you’ll get noticed and contained before you can make a dent. And even if you infect everyone on the globe, you might not end up lethal enough to kill them off before the cure reaches 100%. There are Easy, Normal, Brutal, and Mega-Brutal modes, and you can also unlock pre-game genetic enhancements (by successive wins) that can alter gameplay in different ways. It’s intriguing to try different approaches, testing different starting countries and evolution paths. Each country has a brief profile detailing its economic levels, ecology, and a few other characteristics that suggest certain strengths and vulnerabilities to a plague. Another fun bit is the scrolling “News” updates that occur during the game, keeping you informed as to special events happening in the world. In all, Plague, Inc. is a fun way to destroy the world a few times over while perhaps getting a little cathartic rage out of your system. Oh. Just don’t get me started about Greenland.